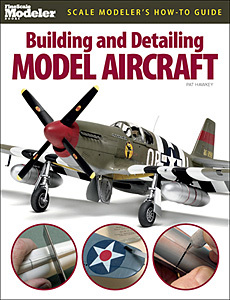 How-to guide that allows you to learn what it takes to master construction and finishing of plastic model aircraft with basic skills such as assembling, aligning, gluing, surface preparation, painting, and decaling. Begins with an overview of the origins of plastic modeling and then takes the reader to state-of-the art in contemporary model construction. Beyond the fundamentals, this volume also presents methods for enhancing kits using aftermarket product, scratch-built details, combination of kits, creating vacuum-formed parts and many other advanced techniques. Everything you need to build better and more satisfying aircraft models. Amply illustrated with 280 color photos. Hawkey; 96 pages. 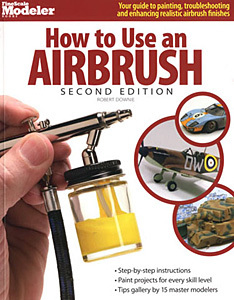 Guide to painting, troubleshooting, and enhancing realistic airbrush finishes - 11 projects covering common problem areas and applications such as detailing a simple snap-together kit, mastering a factory-fresh automotive surface, drawing camouflage patterns, adding dirt and rust, creating complex color schemes, and more. 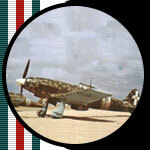 Includes step-by-step instructions, projects suitable for all skill levels, and a tips gallery by 15 master modelers. Illustrated with 240 color photos; Downie. 96 pages. Color Modulation Techniques: Zenithal Light. Black Star 3; Soler. A new way of making models more eye-catching using highlights and shadows. 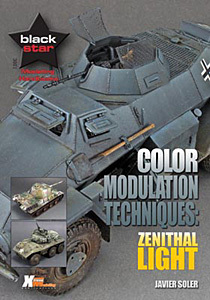 Dedicated to painting the 'Zenithal Light' technique (representing illumination from a single overhead source of light) as applied to military vehicles in 3 scales: Bronco 1/35 scale Sd.Kfz.221 in Panzer Gray; Tamiya 1/48 scale Panther in Tritonal Camouflage; Tamiya 1/48 scale M8 in Olive Drab; and Italeri 1/72 scale Kubelwagen in Panzer Gray. Also demonstrates Zenithal Light on a 2D study. 48 pages.